Early morning here in the Carolinas was chilly…37 degrees on this late April day. I was glad that I had taken a day off from work. It looked to be a beautifully clear day ahead of me. A Wood Thrush (Hylocichla mustelina) was paying another visit…with its sweet, melodious voice filling the air. Later in the morning, I planted a small Wisteria vine (Wisteria frutescens) close to the front porch. I’ve always admired the purple-violet blooms that hang from these vines. 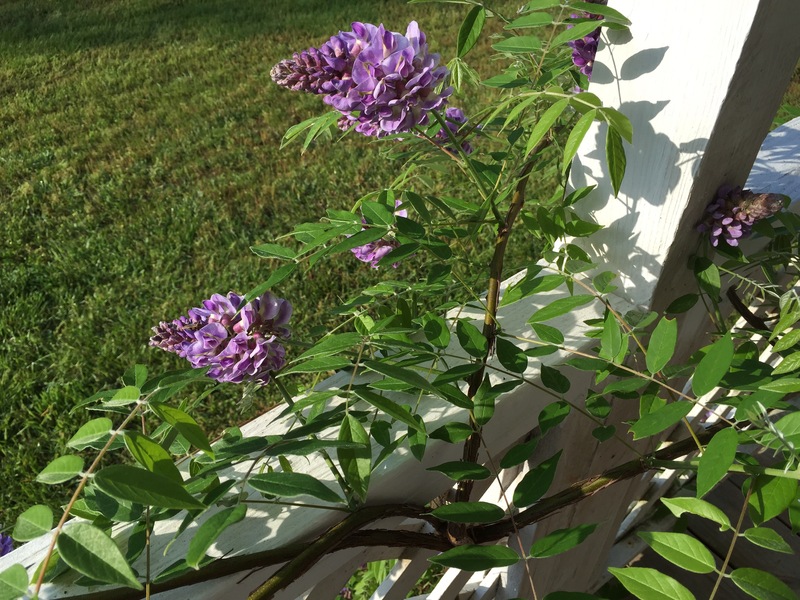 There is a very invasive species of Wisteria, Chinese Wisteria (Wisteria sinensis), that is widespread throughout the Southeast. They’re in full bloom in this area…the vines…pendulous with lavender-purple flowers… winding their way high into trees. Invasive…but very beautiful. The species that I planted is native to America, and supposedly less aggressive in nature…but I’ll keep my clippers handy…just in case. I made another pleasant discovery this morning. There’s Trumpet Honeysuckle (Lonicera sempervirens) growing down near the road. 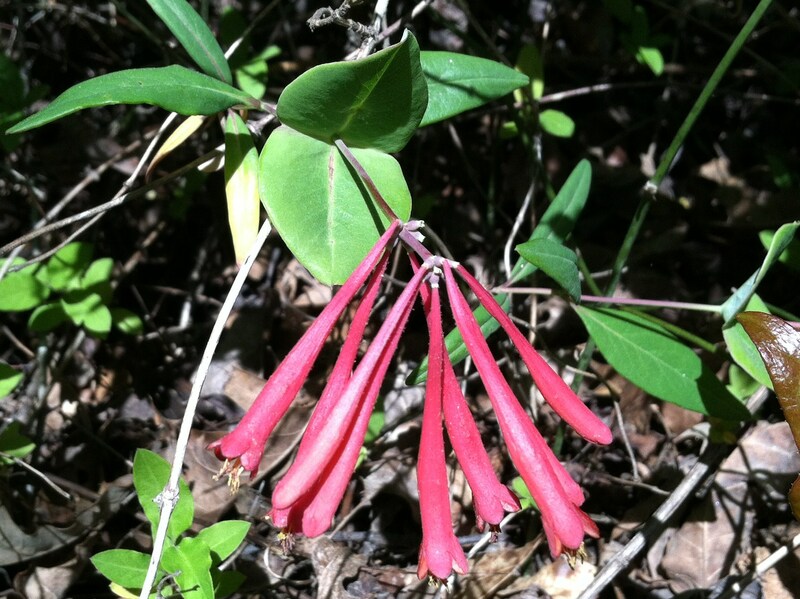 Also known as Coral Honeysuckle, it’s native to this area. The distinctive perfoliate leaves directly below the flowers completely surround the stem. So I carefully lifted it by grasping the turtle by its carapace…making sure my hand wasn’t in biting distance…just in case. I carried the turtle into the woods a bit…and laid it down on a bed of pine needles. 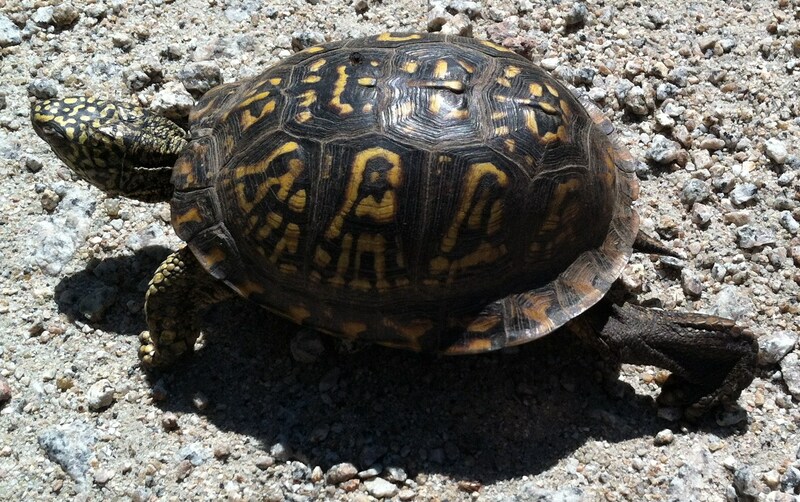 Both of us then went our merry, separate ways…myself to the grocery store…the turtle, to who knows where.